(kleft) a fissure, especially one occurring during embryonic development. 1. any of the slitlike openings in the gills of fish, between the branchial arches. 2. prosoposchisis; failure of union of a facial cleft, causing a developmental defect such as cleft cheek or lip. gluteal cleft that which separates the buttocks. subneural clefts evenly spaced lamella-like clefts within the primary synaptic cleft, formed by infoldings of the sarcolemma into the underlying muscle sarcolemma. 1. a narrow extracellular cleft between the presynaptic and postsynaptic membranes. 2 a fissure, especially one that originates in the embryo, as the branchial cleft or the facial cleft. 1. A fissure or groove. n a longitudinal fissure of opening. n the fissures along the embryonal lines of the junction of the maxillary and lateral nasal processes; usually extend obliquely from the nasal ala to the outer border of the eye (canthus). n a cleft of the marginal gingiva; may be caused by many factors, such as incorrect toothbrushing, a breakthrough to the surface of pocket formation, or faulty tooth positions, and may resemble a V-shaped notch. n a congenital anomaly of the face caused by the failure of fusion between embryonic maxillary and medial nasal processes. n (postoperative cleft), a cleft that has been surgically repaired. n a congenital anomaly of the oral cavity caused by the failure of fusion between the embryonic palatal shelves. n a bone graft placed at the site of a hard palate cleft before teeth have an opportunity to erupt through the gingiva tissue. It creates the architecture necessary for normal eruption of the maxillary teeth and provides support for adjacent teeth. It may also eliminate the need for prosthetic intervention in the future. n a bone graft used to block the oronasal passage in order to facilitate breathing in children with hard palate clefts. n See prosthesis, cleft palate. n the small fissures extending apically from the midline of the gingival margin in teeth subjected to trauma. Although these clefts may be found in traumatism, they are not necessarily diagnostic of occlusal trauma. n a cleft of the palate that has not been surgically repaired. a fissure or longitudinal opening, especially one occurring during embryonic development. the slit-like openings in the gills of fish between the branchial arches; also, the homologous branchial grooves between the branchial arches of mammalian embryos. occasionally seen in cattle particularly Herefords. There is a notch at the mandibular symphysis and the central incisors may be directed centrally. the sagittal cleft in the frog of the horse's foot. entrance to the larynx; called also rima glottidis. common opening of the auditory tubes in birds. a defect in fusion between the central prolabium and one or both lateral mesodermal masses. Most common in dogs of the brachycephalic breeds; may be inherited or caused by environmental factors. Often combined with defects in the palate. Called also primary cleft palate, harelip, cheiloschisis. 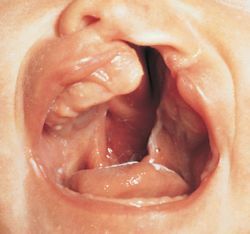 Congenital fissure, or split, may involve the hard or soft palate. A common cause of nasal regurgitation in neonates, especially foals. Known to be inherited in some breeds of cattle and dogs, particularly brachycephalic breeds. Called also secondary cleft palate, palatoschisis. see cleft lip (above). 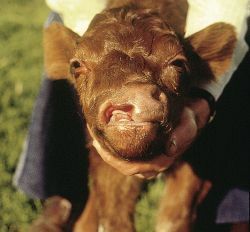 Also occurs commonly in diseases manifest with arthrogryposis, both hereditary as in Charolais cattle and with lupine-induced crooked calf. the anterior portion is divided by a longitudinal cleft. Low doses of topiramate may also increase the risk of oral clefts but to a lesser extent," Patorno added. According to Smile Train, cleft lip and/or palate is the top birth defect in most developing countries, with 120,000 patients still in need of surgery in the Philippines. Often perceived as children with special needs, these children should not be treated any differently as a cleft lip does not affect mental capabilities. The nasal stent is added to the molding plate appliance so that nasal cartilage molding may begin which results in the correction of nasal cartilage deformity present in larger cleft defects. Participants with recognizable syndromes and patients undergone any type of surgical correction procedure were excluded, except for patients with a median cleft lip or median cleft lip or palate, which are very rare and usually occur with some syndromes. Cleft lip and palate are a challenge to the surgeons. Repair of fistula can be a technical challenge even for an experienced cleft surgeon because of lack of availability of local tissue and scarring due to previous surgery. 1007%2Fs00268-015-3367-z) study analyzed data from cleft operations performed by the New York-based charity Smile Train in 83 countries between 2001 and 2011. He said: "The findings reveal a link between GREM1 and specific clinical characteristics that arise in the formation of a cleft lip and palate. A study was carried out as part of the world's largest cleft lip and palate research program, The Cleft Collective, which aims to identify the causes of cleft, the best treatments for cleft and appropriate psychological support for those affected (www. To help reduce a woman's risk for having a baby with an orofacial cleft or other craniofacial condition, health care providers should encourage patients who are thinking about becoming pregnant to commit to a healthy lifestyle (e.
Cleft palate is a frequently found congenital defect of dogs.